Overcoming systemic dormancy and initiating secondary tumor grow under unique microenvironmental conditions is a major rate-limiting step in metastatic progression. Disseminated tumor cells encounter major changes in nutrient supplies and oxidative stresses compared to the primary tumor and must demonstrate significant metabolic plasticity to adapt to specific metastatic sites. Recent studies suggest that differential utilization of pyruvate sits as a critical node in determining the organotropism of metastatic breast cancer. Pyruvate carboxylase (PC) is key enzyme that converts pyruvate into oxaloacetate for utilization in gluconeogenesis and replenishment of the TCA cycle. Patient survival was analyzed with respect to gene copy number alterations and differential mRNA expression levels of PC. Expression of PC was analyzed in the MCF-10A, D2-HAN and the 4 T1 breast cancer progression series under in vitro and in vivo growth conditions. PC expression was depleted via shRNAs and the impact on in vitro cell growth, mammary fat pad tumor growth, and pulmonary and non-pulmonary metastasis was assessed by bioluminescent imaging. Changes in glycolytic capacity, oxygen consumption, and response to oxidative stress were quantified upon PC depletion. Genomic copy number increases in PC were observed in 16–30% of metastatic breast cancer patients. High expression of PC mRNA was associated with decreased patient survival in the MCTI and METABRIC patient datasets. Enhanced expression of PC was not recapitulated in breast cancer progression models when analyzed under glucose-rich in vitro culture conditions. In contrast, PC expression was dramatically enhanced upon glucose deprivation and in vivo in pulmonary metastases. Depletion of PC led to a dramatic decrease in 4 T1 pulmonary metastasis, but did not affect orthotopic primary tumor growth. Tail vein inoculations confirmed the role of PC in facilitating pulmonary, but not extrapulmonary tumor initiation. 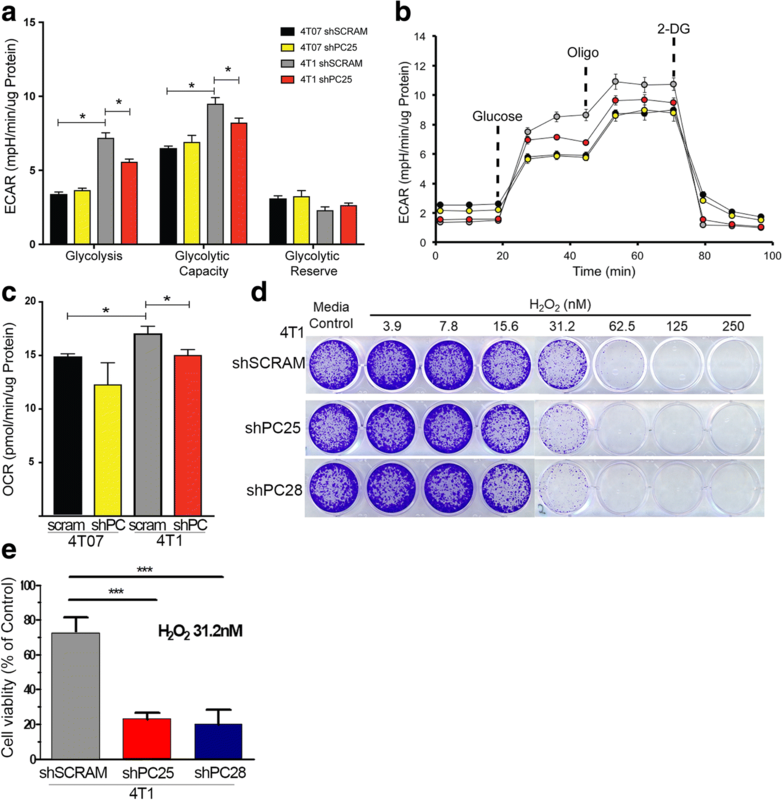 PC-depleted cells demonstrated a decrease in glycolytic capacity and oxygen consumption rates and an enhanced sensitivity to oxidative stress. Our studies indicate that PC is specifically required for the growth of breast cancer that has disseminated to the lungs. Overall, these findings point to the potential of targeting PC for the treatment of pulmonary metastatic breast cancer. Metastasis of primary mammary tumors to vital secondary organs is the primary cause of breast cancer-associated death, with no effective treatment . Metastasis is a highly selective process that requires cancer cells to overcome multiple barriers to escape the primary tumor, survive in circulation, and eventually colonize distant secondary organs. The major sites of breast cancer metastasis include bone, liver, brain, and lungs . Understanding the unique drivers of organ-specific metastases could hold the key to more personalized and more effective therapies for stage 4 patients. Previous studies have sought to characterize stable genetic and gene expression changes that drive metastatic tropism of individual cancer cells [3, 4]. However, the plasticity of metastatic breast cancer cells in response to specific growth environments makes identification of in vivo tropic factors difficult. Metabolic reprogramming is a hallmark of cancer, and is implicated in cell proliferation, survival, and metastatic progression . Considerable progress has been made in understanding the unique metabolic changes cancer cells must undergo to adapt to the hypoxic and acidic microenvironment of the primary tumor . Furthermore, the Warburg effect dictates that tumor cells will continue to utilize glycolysis for energy production even in the presence of abundant oxygen. However, recent studies suggest that metastatic cells have an increased ability to alternate between usage of glycolysis or oxidative phosphorylation (OXPHOS) for energy production in response to particular environmental stresses . Furthermore, expression of the master transcriptional regulator of mitochondrial biogenesis, peroxisome proliferator-activated receptor gamma coactivator 1-alpha (PGC-1α), has recently been linked to the pulmonary metastasis of breast cancer . Overall, these and other studies support the notion that breast cancers capable of reversing the Warburg effect and reactivating mitochondrial OXPHOS are at a selective advantage during initiation of metastatic tumor growth, particularly within the oxygen-rich pulmonary microenvironment. The axis of pyruvate utilization is emerging as a key regulatory point in cancer cell metabolism, and may be critical to organotropism of metastatic breast cancer [9–11]. The majority of pyruvate in primary tumors is converted into lactate to sustain high rates of glycolysis. Indeed, depletion of lactate dehydrogenase (LDH), the enzyme responsible for lactate production inhibited primary tumor growth and subsequently metastasis . Alternatively, pyruvate may enter the TCA cycle via its metabolism by pyruvate dehydrogenase (PDH) or pyruvate carboxylase (PC). Dupuy et al. demonstrated that a key negative regulator of PDH, pyruvate dehydrogenase kinase (PDK1), is essential for liver metastasis . These data suggest that modulation of mitochondrial pyruvate metabolism may determine successful colonization of specific organs by metastatic cancer cells. PC is a mitochondrial enzyme which sustains anaplerosis through its carboxylation of pyruvate into oxaloacetate. PC has recently been shown to be upregulated in lung metastases . Given these data and the critical role of pyruvate metabolism in metastasis, we sought to address the hypothesis that PC is specifically required for the initiation of metastatic outgrowth within the pulmonary microenvironment. The current study characterizes PC expression and genomic amplification in relation to breast cancer patient survival. Furthermore, we utilize several models of breast cancer to delineate the pulmonary tropism that is dictated by PC. Overall, our data clearly indicate that PC is specifically required for initiation of pulmonary metastatic breast cancer, but it is not required for extrapulmonary tumor growth. These findings suggest inhibition of PC may serve as an effective therapeutic target for the treatment of pulmonary metastasis. The five different TRC lentiviral mouse Pcx-targeting short hairpin RNAs (shRNAs) (lentiviral pLKO.1 TRC cloning vector) were purchased from GE Dharmacon, Lafayette, CO USA. The shRNA lentiviral plasmids were cotransfected with psPAX2 and pMD2.G into HEK293T cells using polyethylenimine to obtain lentiviral particles. The 4 T1, 4 T07, and D2.A1 cells were transduced with lentiviral particles for 48 h and stably transduced cells were selected over a span of 14 days in puromycin (5μg/ml). In all cases, separate cells were transduced with scrambled non-silencing shRNAs as a control. The target shRNA sequences were 5′- AAAGGACAAATAGCTGAAGGG-3′(shPC 25) and 5′ –TTGACCTCGATGAAGTAGTGC-3′ (shPC28). The scrambled sequence was 5′-TTCTCCGAACGTGTCACGT-3′. All cells were culture in DMEM containing, 10% fetal bovine serum (FBS), penicillin/streptomycin, 25 mM glucose, 1 mM sodium pyruvate and 4 mM glutamine. Where indicated glucose concentrations were decreased to 5.6 mM. For immunoblot analyses cells were lysed using a modified RIPA lysis buffer containing 50 mM Tris, 150 mM NaCl, 0.25% sodium deoxycholate, 1.0% NP40, 0.1% SDS, protease inhibitor cocktail, 10 mM activated sodium orthovanadate, 40 mM β-glycerolphosphate, and 20 mM sodium fluoride. These lysates were separated by reducing SDS PAGE and probed for PC (Santa Cruz Biotechnology, Dallas, TX, USA), actin (Santa Cruz Biotechnology, Dallas, TX, USA), or β-tubulin (DSHB, Iowa City, IA, USA). Immunohistochemical analyses of formalin-fixed paraffin-embedded tissue sections from 4 T1 primary and metastatic tumors were conducted by deparfinization of in xylene, rehydration, and antigen retrieval using 10 mM sodium citrate (pH 6.0) under pressurized boiling. After inactivation of endogenous peroxidases in 3% H2O2, primary antibodies specific for PC (Sigma-Aldrich, St. Louis, MO, USA) or hypoxia inducible factor (HIF)1-α (Novus, Littleton, CO, USA) were added and incubated overnight. Protein-specific staining was detected through the use of appropriate biotinylated secondary antibodies in conjunction with ABC reagent (Vector, Burlingame, CA, USA). These sections were counterstained with hematoxylin, dehydrated, and mounted. Bioluminescent 4 T1 scram, shPC 25 and shPC 28 cells were grown under 3D culture conditions. Cell growth was quantified via addition of luciferin (GoldBio, St. Louis, MO< USA). Briefly, 1000 cells were plated in each well of a white-walled 96-well dish on top of a solidified 50 μl bed of Cultrex basement membrane extract (BME) from (Trevigen, Gaithersburg, MD, USA). These cells were suspended in growth media containing DMEM (low or high glucose), 10% FBS, and 5% of the BME. Control and PC depleted 4 T1 cells were plated at equal cell density in serum-free medium containing either 1 or 4 mM pyruvate into 8μm fluoroBlok 24-well transwell inserts (Corning, Corning, NY, USA). The bottom well was filled with 10% FBS medium containing either 1 mM or 4 mM pyruvate. Serum-free medium in the bottom well was used as a negative control. Cell migration was quantified after 12 h of incubation using 5 μg/mL of Calcein AM in phosphate-buffered saline (PBS) and a Synergy H1 Multi-mode reader (bottom read: ex./em. 495/530). For wound closure assays control and PC-depleted 4 T1 cells were plated onto six-well plates and grown till 90–95% confluence. Once nearly confluent, each well was scratched using a 200 ul pipette tip and cell media was replaced to 0.5% serum. Wound images were taken at time 0,15 and 24 h. The open wound area was quantified using TScratch software  and percent wound closure was calculated using the following formula: [(open area at time 0 - open area at time x)/open area at time 0] *100. Rate of glycolysis and oxygen consumption were analyzed using the Seahorse XFe24 Analyzer (Agilent, Santa Clara, CA, USA). 4 T1 shScram and shPC25 cells were plated at a concentration of 20,000 cells/well on a Seahorse bioanalyzer plate 24 h before analysis. 4 T07 shScram and shPC25 cells were plated at a concentration of 40,000 cells/well on the same Seahorse bioanalyzer plate to achieve comparable viable cell number at the time of experiment. The glycolytic stress test was conducted according to the manufacturer’s instructions with 10 mM glucose concentration in the media while oxygen consumption rate (OCR) was measured in the presence of 10 mM glucose, 2 mM glutamine, and 1 mM pyruvate. After the assay was completed, cells within each well were lysed into 25 ul of 1× RIPA buffer and protein content was measured using a BCA Assay. Where indicated 4 T1 cells were plated overnight and treated with hydrogen peroxide (H2O2) at multiple concentrations on day 2. The cells were washed with PBS twice on day 7, and stained with crystal violet, lysed, and absorbance was read at 600 nm. Control or PC-depleted 4 T1 cells previously engineered to express firefly luciferase stably were resuspended in sterile PBS (50 μl) and injected orthotopically into the mammary fat pad (2.5 × 104 cells/mouse) of 6-week-old female Balb/c mice. Primary tumor growth and metastasis development was assessed by using digital calipers and by weekly bioluminescent imaging on an advanced molecular imager (AMI, Spectral Instruments; Tucson, AZ, USA). For tail vein assays, control or PC-depleted 4 T07 or D2.A1 cells previously engineered to express firefly luciferase were resuspended in sterile PBS (200 μl) and injected into lateral tail vein (5 × 105 cells/injection) of 6-week-old female Balb/c mice. Mice were assessed for tumor development by weekly bioluminescent imaging on an AMI in vivo imager. All animal studies were performed in accordance with the animal protocol procedures approved by the Purdue Animal Care and Use Committee of Purdue University. One way ANOVA or two-sided t tests were used where the data met the assumptions of these tests and the variance was similar between the two groups being compared. Expression values for PC across breast cancer subtypes were analyzed using a Kruskal-Wallis test, together with a Dunn’s multiple comparisons test. P values of less than 0.05 were considered significant. No exclusion criteria were utilized in these studies. To evaluate the importance of PC in breast cancer progression we initially utilized the BreastMark Kaplan-Meier analysis program to analyze the Molecular Therapeutics for Cancer, Ireland (MTCI) dataset . There was a significant decrease in survival of patients whose tumors express high versus low levels of PC based on the mean value of the entire cohort (Fig. 1a). We also analyzed the Molecular Taxonomy of Breast Cancer International Consortium (METABRIC) dataset consisting of 2509 patient samples annotated for several pieces of the patient-specific data including breast cancer subtype and tumor stage . Analysis of PC gene copy number in the METABRIC and other invasive and metastatic breast cancer datasets indicated that 16–30% of patients demonstrate copy number gains in PC (Table 1). All patient datasets analyzed and the cell line encyclopedia indicated increased PC gene copy number directly correlates with increased PC mRNA expression levels (not shown). Importantly, patients with PC gene amplification in the METABRIC data set displayed significantly reduced survival times as compared to the rest of the cohort (Fig. 1b). Significant differences in PC mRNA expression were observed between subtypes, with the aggressive basal subtype showing the highest mean level of PC expression (Fig. 1c). Changes in PC mRNA expression were also analyzed across tumor stage. No significant correlation in PC expression was observed in regard to tumor stage or tumor size (Fig. 1d, Additional file 1: Figure S1). However, significant outliers were determined by a ROUT analysis in both stage 1 and stage 2 patients (Fig. 1d). The high-level PC outlier patients in the stage 1 group demonstrated a significant decrease in survival as compared to the rest of the stage 1 patients (Fig. 1e). These data suggest that high-level PC expression does not contribute to primary tumor growth, but may be involved in the later stages of breast cancer progression, contributing to decreased patient survival. Further supporting these genomic and mRNA analyses, immunohistochemical (IHC) analysis of lobular and ductal breast carcinoma tissues (n = 10) demonstrated the detection of PC-expressing tumor cells, something that was not observed in normal mammary epithelium (n = 3) (Fig. 1f and Additional file 2: Figure S2). Overall, these data clearly demonstrate genomic amplification and increased expression of PC in more aggressive breast cancers. Furthermore, lack of PC correlation with primary tumor stage/size suggests a functional role for this protein in driving the later stages of breast cancer progression. To examine the functional role of PC in breast cancer metastasis, we first assessed PC expression levels across several breast cancer progression series. In contrast to the patient data shown in Fig. 1, PC expression failed to correlate with increasing metastatic capacity of the MCF10A series, the D2-hyperplastic alveolar nodule (HAN) series, and the 4 T1 series (Fig. 2a) [17–19]. Previous studies suggest that PC expression can be increased during epithelial-mesenchymal transition (EMT) through the transcription factor Snail [9, 20]. While stimulation of the 4 T1 cells with transforming growth factor (TGF)-β1 induced a robust morphological change consistent with EMT, we did not observe any change in PC expression (Additional file 3: Figure S3A and S3B). Furthermore, expression of Snail in the MCF-10-T1 k cells did not robustly increase PC expression (Additional file 3: Figure S3C). The presence of glucose can enhance expression of PC through activation of one of two distinct promoters . In contrast, PC is also required for gluconeogenesis, and therefore its expression can be selectively enhanced under glucose-deprived conditions . 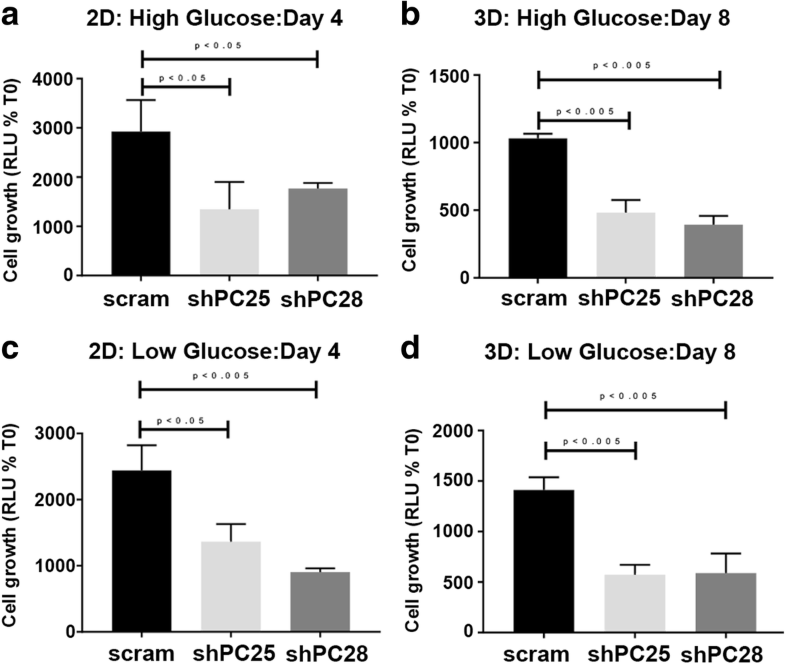 We observed that depletion of exogenous glucose from sodium pyruvate-containing growth media of 4 T1 and 4 T07 cells led to increased expression of PC (Fig. 2b). 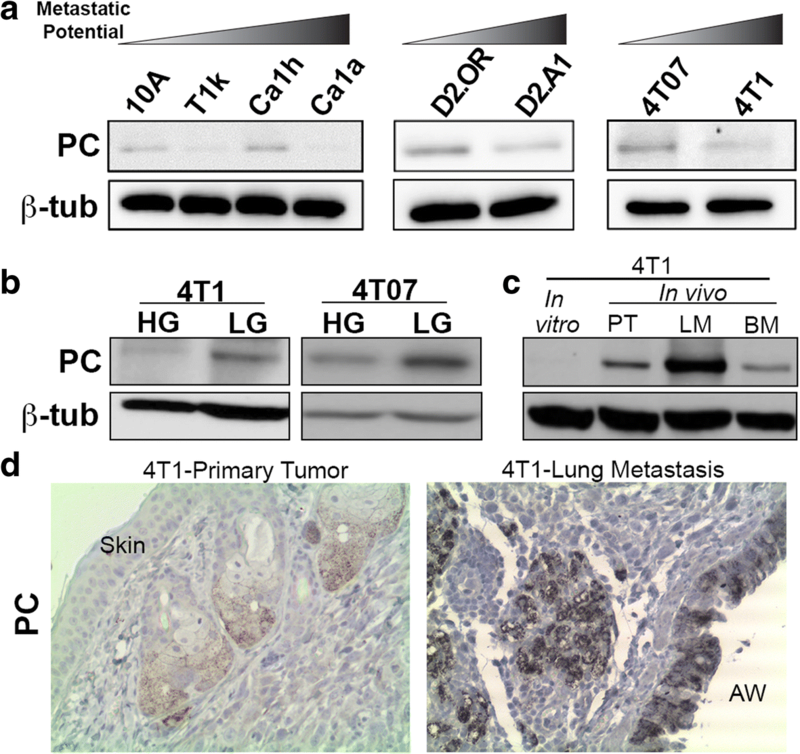 We also observed an increase in PC expression in orthotopic 4 T1 primary tumors (Fig. 2c). However, upon IHC analysis we found that PC was highly expressed in the murine sebaceous glands within these tumors, but was still not detectable in 4 T1 tumor cells (Fig. 2c and d). Expression of PC was further enhanced in 4 T1 lung metastases and IHC analyses clearly indicated that PC was expressed in both bronchial epithelial cells and tumor cells (Fig. 2c and d; ). Taken together these data suggest that in contrast to the primary tumor, growth within the pulmonary microenvironment demands high levels of PC. We next depleted PC expression in the highly metastatic 4 T1 cells using two independent shRNAs . Depletion of PC did not affect cellular migration as assessed by both a transwell and a wound healing assay (Additional file 4: Figure S4). However, depletion of PC did result in inhibition of cell growth irrespective of glucose concentration or whether cells were grown on two-dimensional (2D) plastic or within 3D hydrogel cultures (Fig. 3). In contrast to in vitro culture, there were no significant differences in the growth of PC-depleted primary tumors as compared to control (Fig. 4a and b). However, resultant pulmonary metastases observed in these mice were drastically inhibited upon depletion of PC (Fig. 4c-e). Inhibition of pulmonary metastasis was quite dramatic in the 4 T1 model, but overall inhibition of thoracic metastasis, which includes pulmonary metastases, cells within the pleural space, and bone metastases throughout the spine and rib cage, was not as robust (Fig. 4d and e). These data, together with the lack of change in primary tumor growth (Fig. 4b), and enhanced expression of PC in lung metastases (Fig. 2d) led us to hypothesize that PC may be specifically required for tumor growth within the pulmonary microenvironment. To examine the role of PC in pulmonary tumors, we utilized a tail vein injection approach with the D2.A1 cells. These cells grow very well when delivered into the lungs via the tail vein, but do not demonstrate extrapulmonary metastasis beyond this site [23, 24]. Similar to the 4 T1 cells, PC could be readily depleted from these cells using stable expression of shRNAs (Fig. 5a). Equal pulmonary delivery of control and PC-depleted cells was verified by bioluminescent imaging (Fig. 5b). Furthermore, early bioluminescence readings taken 3 and 8 days after tumor cell injection indicated that initial seeding within in the lungs was not affected by PC depletion (Fig. 5c). However, pulmonary outgrowth was drastically decreased in D2.A1 cells lacking PC (Fig. 5c-e). These findings strongly suggest that PC is required for initiation of tumor growth within the pulmonary microenvironment. We have previously established that unlike the D2.A1 cells, the 4 T07 cell model will not only grow in the lungs following tail vein inoculation, but will also form extrapulmonary metastases primarily in the upper thoracic region of the animal . 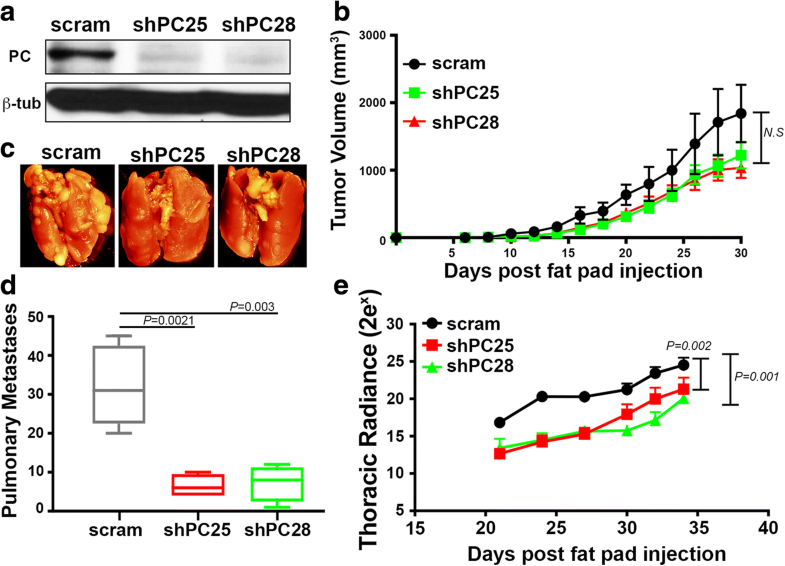 Therefore, we depleted PC in 4 T07 cells to evaluate the role of PC in pulmonary versus extrapulmonary tumor growth following injection into the lateral tail vein (Fig. 6a and b). 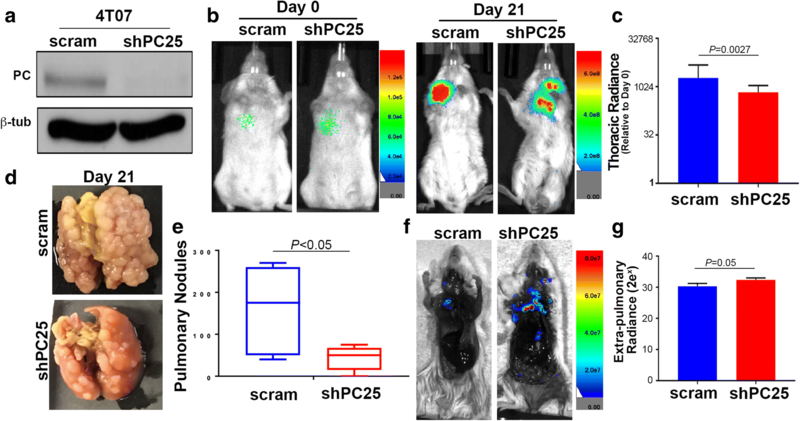 Bioluminescent imaging verified equal pulmonary delivery, but a decrease in ultimate thoracic luminescence generated by PC-depleted 4 T07 cells 21 days after tumor cell injection (Fig. 6b and c). Upon necropsy, a dramatic difference in macroscopic pulmonary tumor nodules once again confirmed the requirement of PC for robust tumor growth within the lungs (Fig. 6d and e). 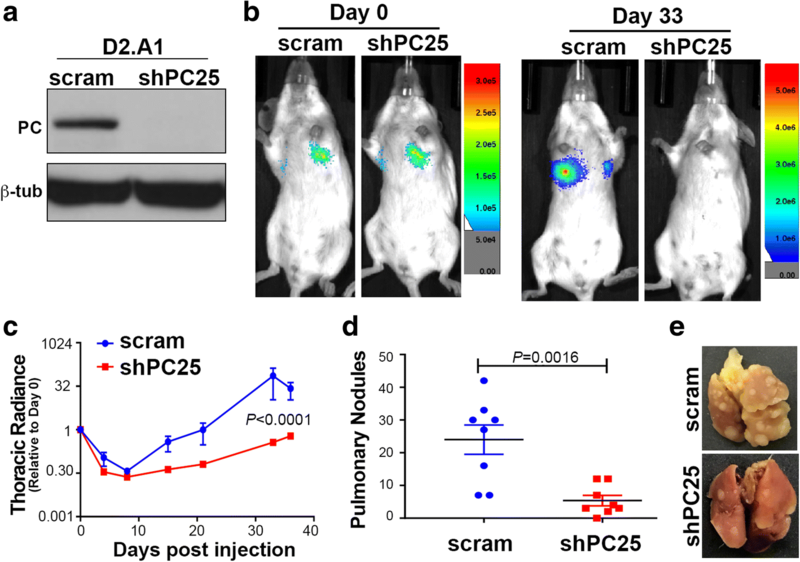 In contrast, luminescent imaging of carcasses in which tumor-bearing lungs had been removed demonstrated a significant increase in extrapulmonary metastases generated by PC-depleted cells as compared to control cells (Fig. 6f and g). These data strongly suggest that while PC is required for growth in the lungs its expression is not required, or maybe inhibitory to the growth of extrapulmonary metastases. To investigate the importance of PC in the metabolic plasticity of metastatic breast cancer cells, rates of glycolysis and oxygen consumption were measured using the XFe24 Seahorse bioanalyzer. Both glycolysis, as measured by the extracellular acidification rate (ECAR), and oxygen consumption rate (OCR) were significantly higher in 4 T1 versus 4 T07 cells (Fig. 7; ). Along these lines, PC depletion resulted in a significant decrease in both glycolysis and OCR in 4 T1 cells, but not 4 T07 cells (Fig. 7a and c). Glycolytic capacity was further measured by injecting oligomycin (Fig. 7b), an ATP synthase inhibitor that shifts cell dependence on ATP generation towards glycolysis. Consistent with previous reports, 4 T1 cells demonstrated significantly higher glycolytic capacity than the 4 T07 cells, and again this was dependent upon expression of PC (Fig. 7a; ). The hypoxic environment of the primary tumor induces the stabilization of HIF-1α and shutdown of the TCA cycle, but newly developing pulmonary metastases lose HIF-1α expression (Additional file 5: Figure S5; ). Thus, metabolic adaptation upon loss of HIF-1α is a major hurdle that must be overcome during initiation of pulmonary metastatic outgrowth. HIF-1α levels are constitutively low in in vitro culture, consistent with the requirement of PC for in vitro cell growth (Fig. 3). Therefore, to further recapitulate the enhanced oxidative stress within the pulmonary microenvironment, we treated cells with increasing concentrations of hydrogen peroxide (H2O2). Consistent with our recent studies we observed an enhanced sensitivity to H2O2 upon depletion of PC (Fig. 7d and e; ). Herein, we utilized several syngeneic models of breast cancer to demonstrate that initiation of pulmonary metastatic outgrowth is strongly dependent on PC. We also demonstrate that PC is not required for primary mammary tumor growth or extrapulmonary metastasis. Our findings are nicely supported by previous studies in lung cancer that similarly demonstrate the requirement of PC for in vivo tumor growth [10, 29]. The specific aspects of the pulmonary microenvironment that demand PC expression remain to be determined definitively. However, enhanced oxygen content and increased oxidative stress are very unique aspects of the pulmonary microenvironment with respect to pyruvate utilization. Under hypoxic conditions of primary tumors, extrapulmonary metastases, and macroscopic pulmonary tumors, pyruvate utilization mainly occurs through anaerobic glycolysis that is driven by HIF-1α-induced expression of hexokinase, LDH, and pyruvate kinase M2 . HIF-1α also inhibits pyruvate dehydrogenase via upregulation of PDK1, further blocking aerobic glycolysis and increasing lactate production . Depletion of HIF-1α or HIF-1α target genes such as LDH or carbonic anhydrase IX (CAIX) in 4 T1 cells inhibits primary tumor growth, therefore decreasing subsequent macrometastasis [12, 13, 31]. In contrast, we propose a model that in the oxygen- and pyruvate-rich microenvironment of the lungs HIF-1α is directed to proteosomal degradation and metastatic cells must transiently shift to PC-mediated aerobic utilization of pyruvate to initiate metastatic outgrowth. Only once macroscopic metastases are formed and hypoxia is reestablished are tumors able to reengage HIF-1α and return to anaerobic glycolysis. 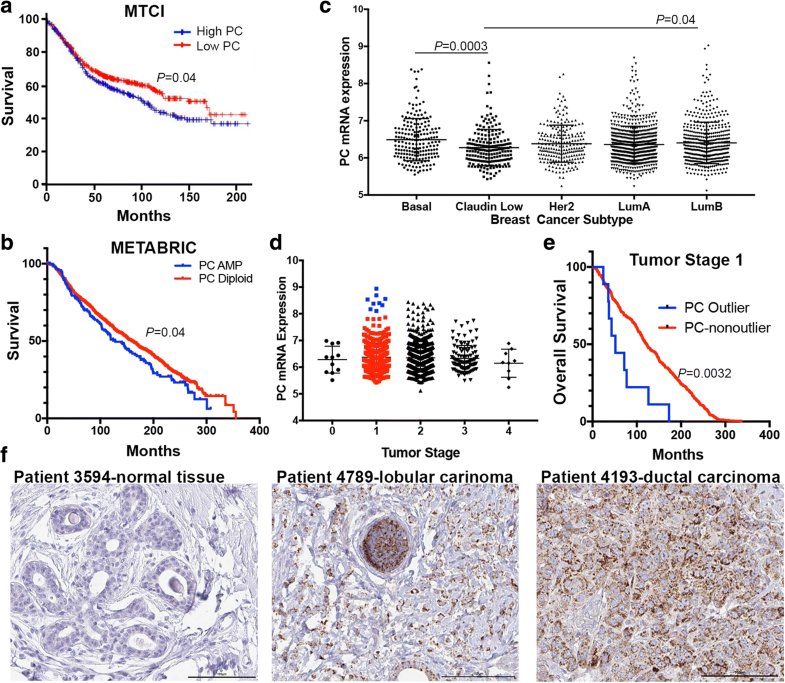 Our analysis of the METABRIC dataset demonstrates decreased survival of stage 1 breast cancer patients with genomic amplification of PC. These findings are completely consistent with our mouse studies in that high-level PC expression does not contribute to primary tumor growth, but these cells have an enhanced antioxidant defense system and are more metabolically fit for aerobic initiation of pulmonary metastatic outgrowth following systemic dissemination. Indeed, recent studies clearly indicate that systemic dissemination of primary tumor cells is an early step in metastasis whereas overcoming dormancy within secondary organs is the rate-limiting process leading to patient lethality . Therefore, our findings suggest assessment of PC genomic amplification or mRNA expression could serve as an effective prognostic biomarker to predict for metastatic relapse in patients diagnosed with early-stage primary tumors. Additionally, PC could also serve as therapeutic biomarker in conjunction with application of direct pharmacological inhibitors of PC or more general inhibitors of oxidative phosphorylation such as IACS-010759, which is currently in clinical trials (NCT03291938). Overall, the data herein present a comprehensive analysis of patient data and syngeneic mouse models that uniformly support a specific role for PC in facilitating initiation of pulmonary metastatic tumor growth. Moreover, we present findings that demonstrate a role for PC in facilitating metabolic plasticity of disseminated breast cancer cells. Our findings clearly point to the potential of genomic amplification of PC as prognostic biomarker and as a therapeutic target for the treatment of pulmonary metastatic breast cancer. Members of the Wendt Laboratory are thanked for their critical reading of the manuscript. We kindly acknowledge the expertise of the personnel within the Purdue Center for Cancer Research Biological Evaluation Core. We also acknowledge the use of the facilities within the Bindley Bioscience Center, a core facility of the NIH-funded Indiana Clinical and Translational Sciences Institute. This research was supported in part by the American Cancer Society (RSG-CSM130259) to MKW and the National Institutes of Health (R01CA207751) to MKW, the National Institutes of Health (R25CA128770) to DT and the Indiana Elks Charities to DT. Support was also provide by the Indiana Clinical and Translational Science Institute to MKW and DT (UL1TR001108) and the Purdue Center for Cancer Research via an NIH NCI grant (P30CA023168). AS, HC, and TW contributed to the design of the experiments, completed experiments, and contributed to the writing of the manuscript. MKW and DT contributed to the design of the experiments, supervised experiments, and contributed to the writing of the manuscript. All authors read and approved the final manuscript. All animal studies were performed in accordance with the animal protocol procedures approved by the Purdue Animal Care and Use Committee of Purdue University.